Read mail right on Apple Watch, then dictate a reply, choose a prepared response, or switch to iPhone to type a response. WARNING: For important information about avoiding distractions that could lead to dangerous situations, see Important safety information. Read mail in a notification. You can read a new message right in the notification when it arrives—raise your wrist and wait for the message to appear. To dismiss the notification, swipe down from the top or tap Dismiss at the end of the message. If you miss the notification, swipe down on the watch face later to see unread notifications, then tap it there. To control email notifications on Apple Watch, open the Apple Watch app on iPhone, tap My Watch, then tap Mail. Read mail in the Mail app. 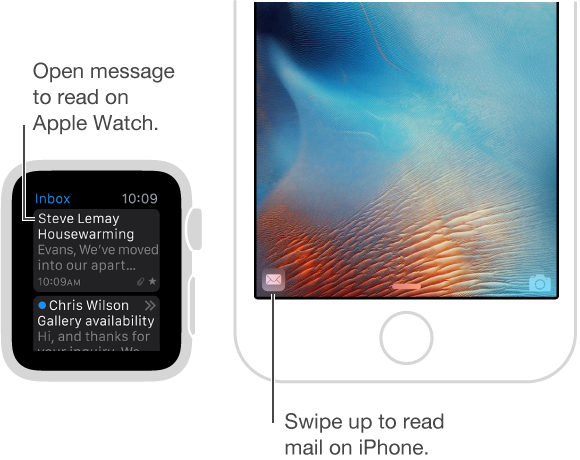 On Apple Watch, open the Mail app , turn the Digital Crown to scroll the message list, then tap a message. Note: Apple Watch supports most text styles and some formats. Quoted text is colored but not indented. 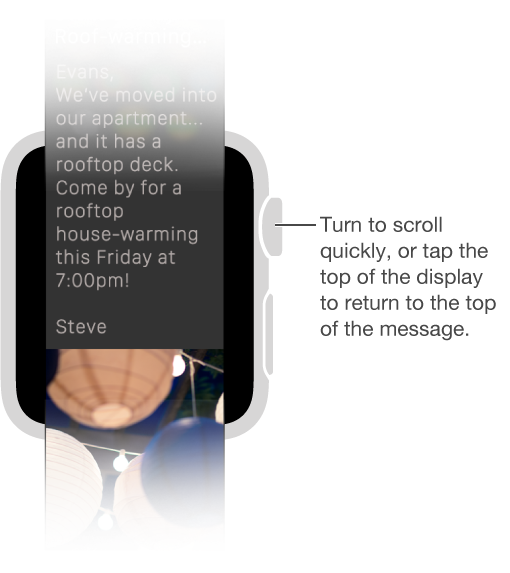 If you receive an HTML message with complex elements, Apple Watch tries to display a text alternative of the message. To see the formatted message, read it on iPhone. Switch to iPhone. Some messages are easier to read on iPhone—wake iPhone, then swipe up on the Mail icon in the lower-left corner of the Lock screen. Jump to the top of a long message. Turn the Digital Crown to scroll quickly, or just tap the top of the display. Open Phone or Maps. Tap a phone number in a mail message to open Phone , or an address to open Maps .